Our silver double dimmer is really rather sublime. We’ve banished the shiny chrome look and have cleverly designed an altogether more sophisticated finish in beautiful brushed steel. Hurrah we hear you cry! It’s these subtle style details that make our switches a real cut above the rest. We know that there are so many uninspiring light switches out there, and that’s exactly why we made it our mission to bring you a collection of truly marvellous switches that not only do their job perfectly but look fantastic too. You could call it a light switch revolution. 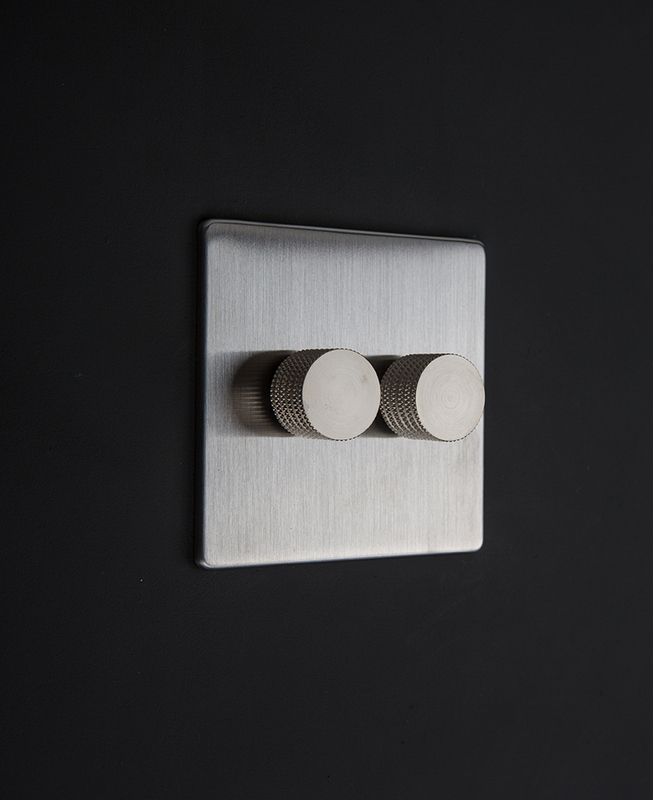 We’ve banished the boring plastic white and we’ve culled the ugly chrome to bring you the very best designer switches. Our classic silver double dimmer is one part of our fantastic range. 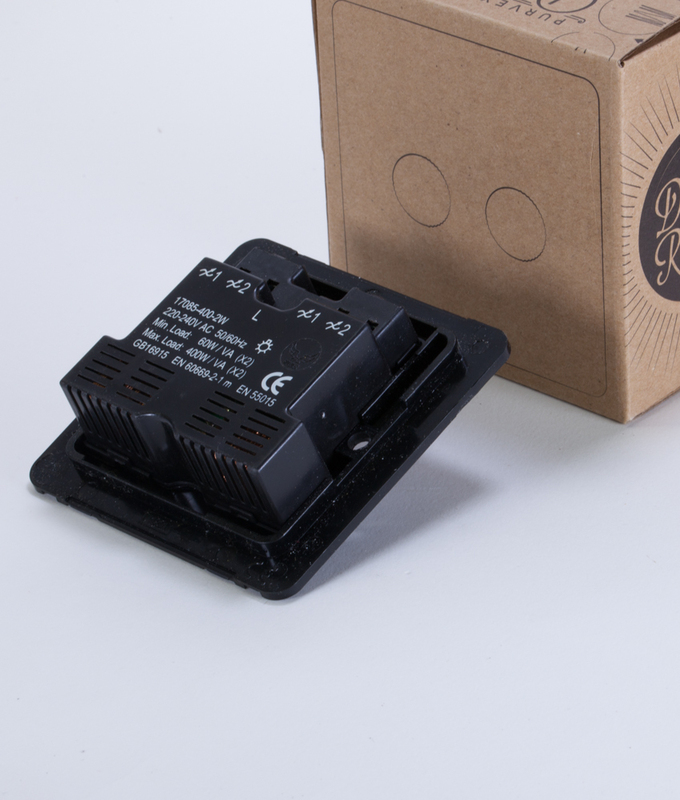 It’s the real Daddy of switches; heavyweight, robust, dependable and classically good looking. The subtle grey tones and smooth finish of the plate, combined with the knurled knob give it a gorgeously simplistic look. There are four fabulous finishes of knob to choose from. And just look at that beautiful knurling around the edge too – never has something so practical looked so good! It makes it turning it on and off an absolute pleasure. And because the silver double dimmer is not too ‘hey look at me’, it’ll slot pretty much into all interior styles, quietly getting on with its job. 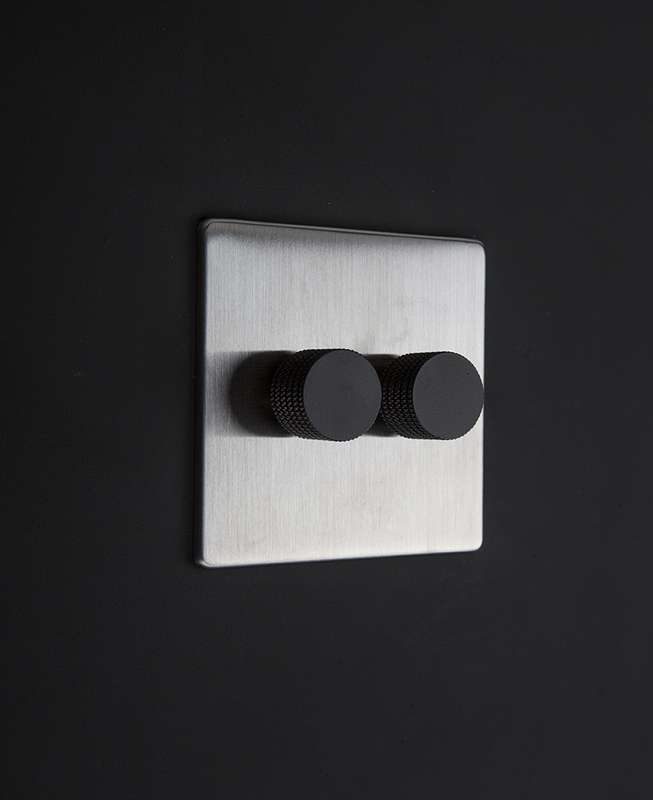 If you love this double dimmer switch, check out the matching single dimmer switch and our other coordinating silver light switches and plug sockets. Check out guide light switches explained to find out the difference between 1, 2 & 3 gang plus when to use 1 way, 2 way and intermediate switches.